Kyle Moslow, third-year exercise science major from Buffalo, N.Y., spots for athlete Max Mikowski, a third-year biosciences major from Cheektowaga, N.Y.
RIT’s bachelor’s degree in exercise science provides students with academic training and practical experiences, right on campus. It is the first new program offered through the Wegmans School of Health and Nutrition in the College of Health Sciences and Technology and began this fall with four internal transfer students, including Kyle Moslow and Rachael Gardner. The first freshman class will begin in the next academic year. Moslow and Gardner are gaining a comprehensive education in a field that applies health, fitness, physiology, biomechanics and psychology with different goals: enhancing athletic performance and managing disease through exercise. Moslow is developing the skills he needs to work with athletes. Gardner is pursuing the specialty known as clinical exercise physiology to help people in poor health. This branch of the field uses exercise as therapy for people with cardiac disease, type 2 diabetes, high cholesterol and other problems. “The program prepares students for these two areas of exercise science where jobs are available and growth is happening,” said Bill Brewer, director of the exercise science program. The U.S. Bureau of Labor Statistics projects employment in health care occupations—including athletic trainers and exercise physiologists—to grow 19 percent by 2024. The anticipated 2.3 million new jobs reflects the demands of aging Baby Boomers and increased health care coverage in the general population. Moslow jumped at the opportunity to intern with the RIT men’s hockey strength and conditioning program and assists RIT Coach Nate VanKouwenberg during training sessions for the 27 Division I hockey players. VanKouwenberg developed a program for Moslow to observe the athletes, demonstrate exercises and teach new techniques. “Kyle’s not just standing in my shadow; he’s another coach in the room,” VanKouwenberg said. Gardner, a U.S. Army veteran from Fairport, N.Y., transferred into exercise science as a fourth-year student and will be the program’s first graduate this spring. Her goal is to improve people’s health as a certified exercise physiologist. She is interested in integrative medicine, which focuses on wellness, and using exercise to help people prevent—not just manage—chronic disease. After graduating, Gardner will take the American College of Sports Medicine exam to become a certified clinical exercise physiologist. She currently volunteers as a health coach through a program run by Rochester General Hospital and available to select students through the RIT and Rochester Regional Health Alliance. Gardner’s experiences in the training program on campus and as part of a health care team have reinforced her goal to work with patients. 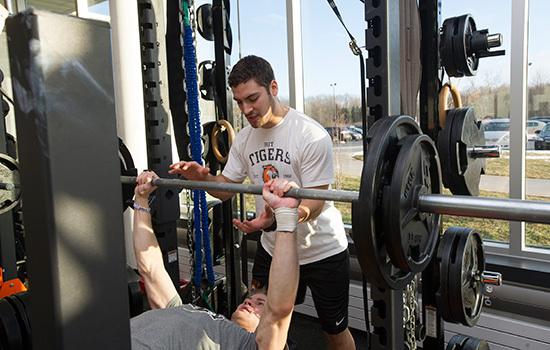 Exercise science majors can gain practical experience through RIT’s student wellness and Better Me employee wellness initiatives. Students who become certified personal trainers through the American College of Sports Medicine can take advantage of opportunities to use their skills on campus to help people improve their health and fitness. Wellness is an aspect of a company’s culture and also a way to control medical expenditures, said Michael Stojkovic, associate director of wellness for the human resources department and adjunct teacher in the exercise science program. Co-ops with the Better Me program will give students experience working in worksite wellness with special populations like at-risk employees, he said. The exercise science major is a four-year BS degree offered through the Wegmans School of Health and Nutrition in the College of Health Sciences and Technology. The program requires completion of 120 credits, including 40 credit hours of core courses and nine professional electives. The core courses cover exercise physiology, fitness, biomechanics and kinesiology, or how the body moves, as well as personal training, worksite health promotion and sports psychology, among other topics. Professional electives allow students to specialize in the program’s athletic or clinical tracks. Completion of the exercise science degree prepares graduates to take the certified strength and conditioning specialist exam offered by the National Strength and Conditioning Association and/or the certified clinical exercise physiologist exam administered by the American College of Sports Medicine. For more information, contact Bill Brewer, director of the exercise science program, at wsbsci@rit.edu. As a graduate student in Ghana, Brenda Abu witnessed the toll of anemia, a condition that afflicts as many as 70 percent of the children and 45 percent of the women in that West African nation. Her experiences convinced Abu to pursue a career researching nutrition, specifically looking for ways to reduce anemia in mothers and their children.